The federal exchange, HealthCare.gov, experienced a rocky rollout in the fall of 2013. Since then, its information technology infrastructure has vastly improved and the second year of open enrollment proceeded much more smoothly.7 As of February 22, 2015, 8.8 million people signed up for health insurance coverage for 2015 through Healthcare.gov and nearly 2.9 million enrolled through state exchanges.8 However, while many of Healthcare.gov’s early technical problems have been ironed out, ongoing legal challenges(d) call into question whether premium subsidies – a critical part of the ACA – can be granted to enrollees who use the federal marketplace. 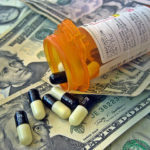 Without the subsidies, millions could lose coverage and the federal exchange itself could fail (the decision is not expected to impact state-run exchanges). 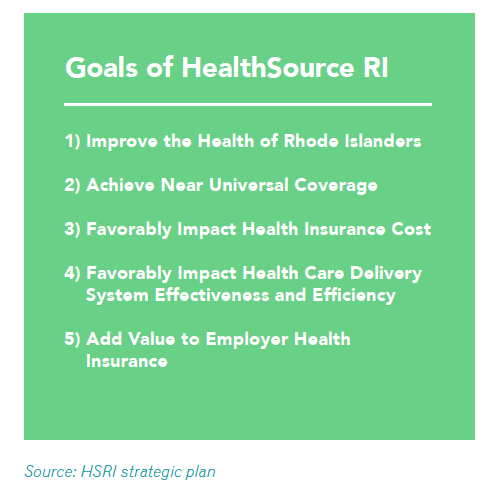 HealthSource RI was created by an executive order from Governor Lincoln Chaffee in September 2011.10 Rhode Island built HSRI as part of a larger Unified Health Infrastructure Project (UHIP). 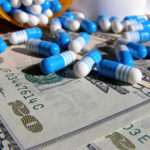 UHIP is a technology platform designed to integrate disparate government programs, including Medicaid and the insurance exchange, under one eligibility and management system. (e) Almost all HSRI funding to date has come from the federal government, which has provided a total of $153 million in grants so far.11However, federal funding will be phased out in 2015 and the state will need to step in if HSRI is to continue. 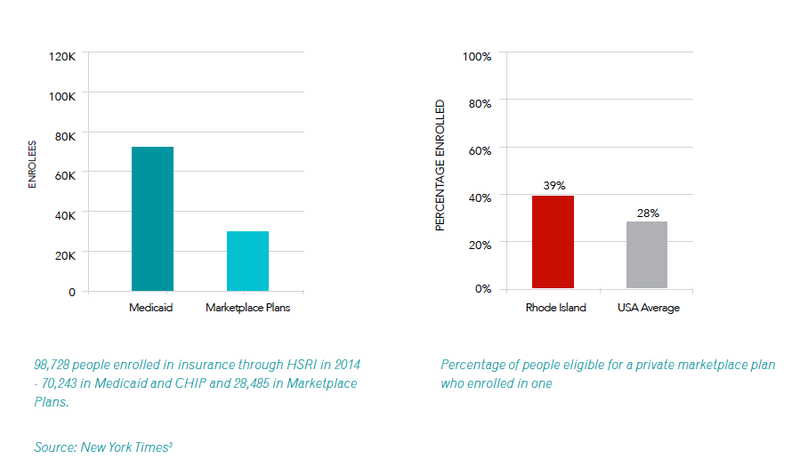 However, when you add in the people who enrolled in Medicaid and CHIP through UHIP, the proportion of Rhode Islanders who have used HSRI to access coverage is much higher. 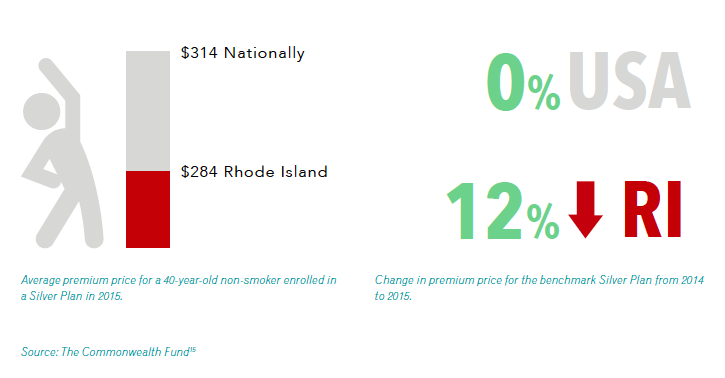 A total of 194,890 individuals were determined eligible for Medicaid or CHIP between October 1, 2013 and February 15, 2015.23 Altogether, 228,368 Rhode Islanders have used the UHIP/HSRI system to get connected to coverage, a number that represents roughly 22% of the state’s population. Furthermore, the number of people using the exchange at any one time is deceiving: people move in and out of insurance coverage according to their employment status, marital status, state of residence, family composition, and income level. 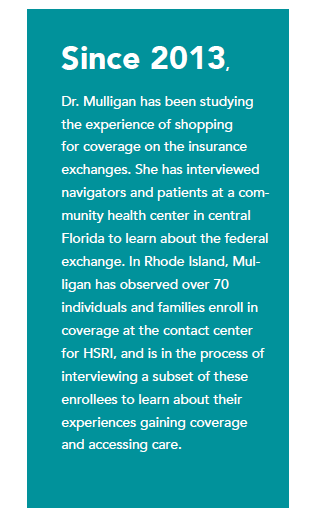 In Rhode Island in particular, the health insurance exchange has been part of an on-going and coordinated reform effort to increase administrative efficiency and simplify the process for families. HSRI has been integrated with other state programs and operations, especially Medicaid eligibility processing through UHIP. This provides a one-stop shopping experience for enrollees, something that is particularly valuable for the many families with members eligible for different programs. (l) HSRI has also been working closely with other stakeholder groups in the state, including insurance carriers, hospitals, providers, community health centers, small businesses, and patient advocacy groups. Any change to the exchange should consider how these groups will be impacted. 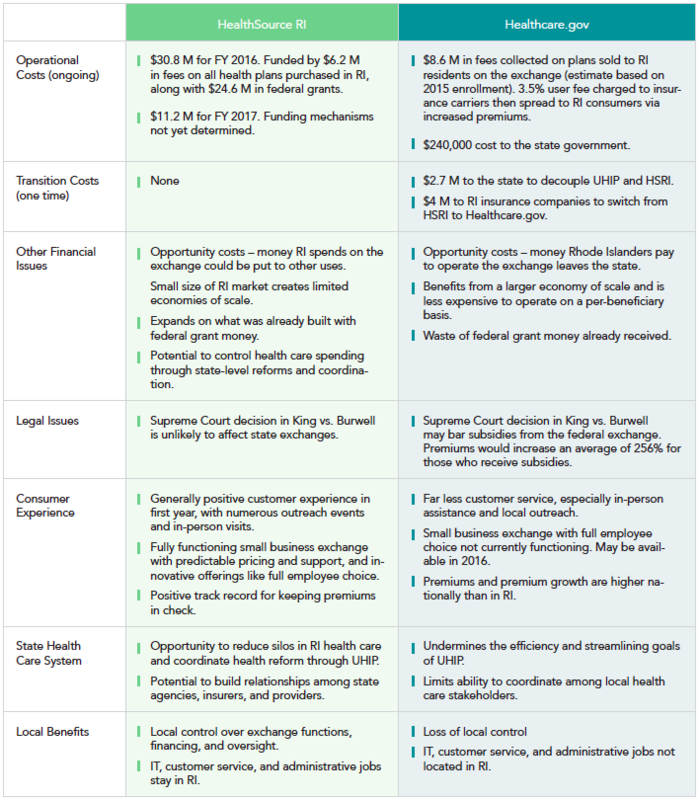 Josh Archambault (2014) “Small State, Big Consequences: Will Rhode Island Be The First With a 'Functional' State-Based Exchange To Switch To Healthcare.gov?” Forbes, May 22. Jennifer Boddan (2014) “Mattiello: State health exchange not ‘efficient’,” The Providence Journal, December 22. 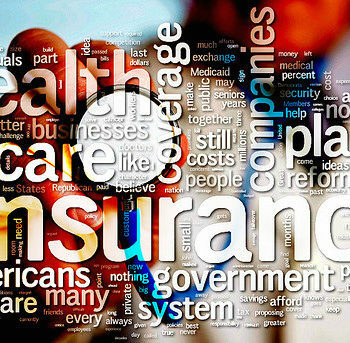 U.S. Department of Health & Human Services (2015) “Nationwide nearly 11.7 million consumers are enrolled in 2015 Health Insurance Marketplace coverage [press release],” March 10. State of Rhode Island Division of Planning (2013) “Selected Rhode Island Economic Characteristics, 2013,” Providence, RI. 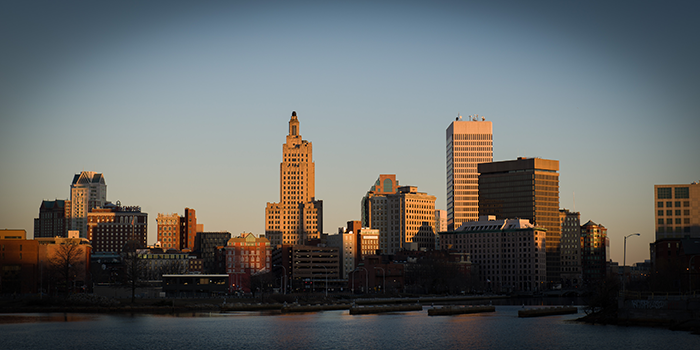 HealthSource RI (2015) “HealthSource RI releases enrollment, demographic and volume data through February 23, 2015 [press release],” February 26. 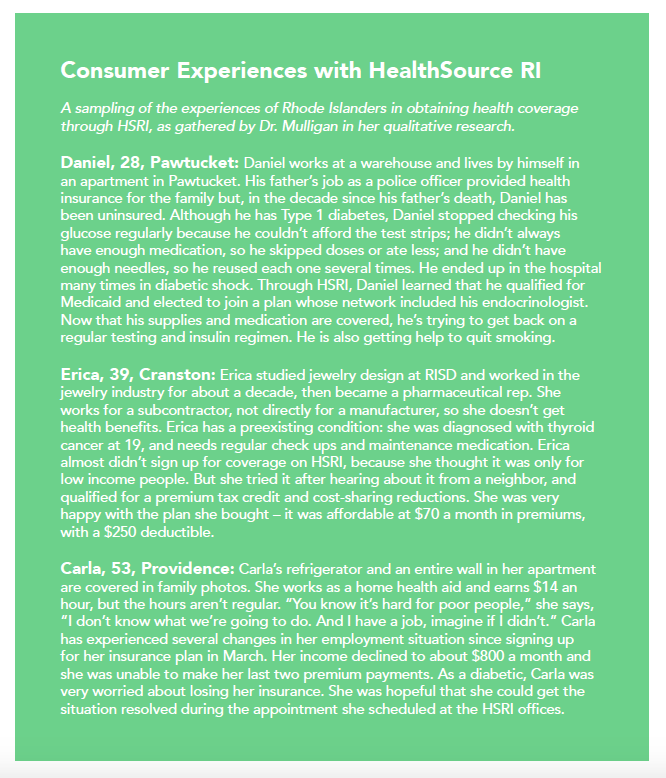 HealthSource RI (2014) “Health Coverage Enrollment Report: October 1, 2013  April 30, 2014,” Providence, RI. HealthSource Rhode Island (2014) “HealthSource RI releases enrollment, demographic and volume data through March 31 [press release],” April 3. Phil Galewitz (2013) “State Spending on Consumer Assistance Could Have 'Huge Impact' On Marketplace Enrollment” Kaiser Health News, May 5. HealthSource RI (2015) “HealthSource RI Open Enrollment II, November 15, 2014  February 15, 2015,” unpublished report, Providence, RI. Liam C. Malloy and Shanna Pearson-Merkowitz (2015) “The Economic Impact of Expanding Medicaid,” Footnote, March 10. 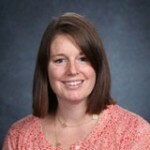 Dr. Jessica Mulligan is assistant professor of Health Policy and Management at Providence College. She earned her Ph.D. in Anthropology from Harvard University. Trained as a medical anthropologist, her current research project uses life history interviews to explore the health and financial impacts of insurance coverage on the formerly uninsured.